Father's Day is a special occasion and it is a great excuse to make your father a special drink. This list includes some of the most popular "manly drinks," most of which require one type of whiskey or another but a few also feature rum, tequila, or a little of everything (see Long Island Iced Tea). The point is that he probably doesn't want any of the fruity, creamy or otherwise "girly" cocktails and you won't find any of them here. Pick up your dad's favorite spirits and mix him up one of these very "masculine" drinks. The Manhattan is the perfect upscale cocktail for the whiskey-loving Dad. Buy him a great bottle of rye which he may not get all the time, and stir this one up with dinner. If your father is more of a Scotch man, go for it and make a Rob Roy instead, or give him the real treat of a bottle of both whiskeys along with a vermouth and let him decide. 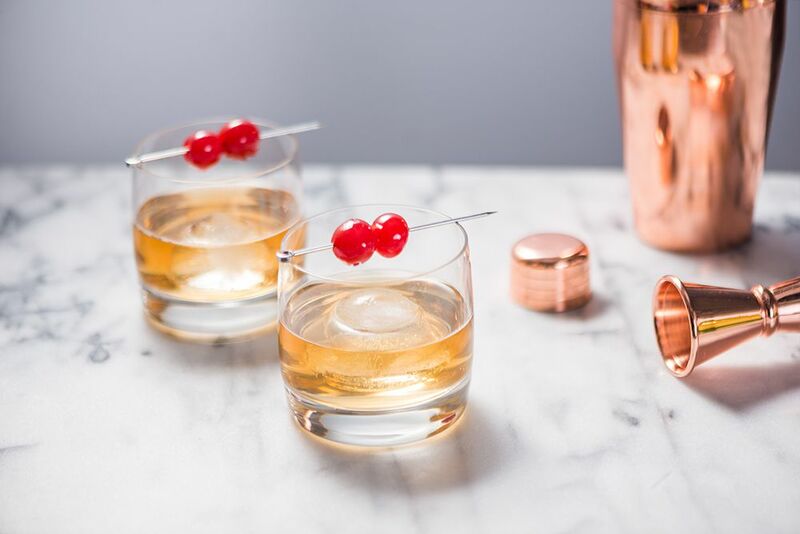 Ah, the Rusty Nail, the true Scotch lover's cocktail. This is a very nice way to enjoy almost any Scotch whiskey and because the Drambuie is Scotch-based, it is a perfectly subtle addition, beating a Scotch on the rocks out of the water (so to speak). The Godfather is simple, sophisticated and another easy way to spice up the average glass of Scotch. A small amount of amaretto contributes just enough mellow almond flavor to define a completely different experience without overpowering the whiskey. Try out this Frisco Sour on Dad if you think he would like a little pucker in his whiskey. It is slightly more complex than the classic Whiskey Sour due to the addition of the Cognac-based Benedictine and lime juice (fresh-squeezed of course). If you choose a Sidecar for Father's Day you have a few more choices to make. Cognac and Armagnac are the traditional bases for the cocktail but bourbon is more popular now and makes a very pleasant option. Or if Dad isn't quite a whiskey fan, go with a Boston Sidecar in which brandy and rum make up the base. Fizz drinks are great and if Father's Day ends up being one of the warmer days of June the Imperial (or Whiskey) Fizz is an excellent cool-me-down option. Essentially, you're taking a Whiskey Sour and adding soda to create a nice highball. Another option is to serve both drinks, maybe one before dinner and the other after a round of golf. Here's a hot and spicy tequila Martini begging for the guy who really likes to spice it up. The key is the garnish, without it you would merely have a Tequini, and what's the fun in that? There had to be a rum drink on this list somewhere. Since the Rum and Coke is one of the most popular among men I thought we'd go with a slightly more interesting variation, considering it is a special occasion and all. It's really nothing more than a little amaretto that distinguishes it apart from the other, but sometimes it's the smallest things that can make all the difference. You will need to raid the entire liquor cabinet to make this one up for Dad. The Long Island Iced Tea is notorious for being a strong drink and rightfully so because it contains five spirits. Men love this one and it makes the perfect afternoon patio companion while steaks are on the grill. And what would a manly drink list be without one that specifically calls for Jack Daniels? That brand of Tennessee whiskey is a favorite among many whiskey drinkers and beyond a Jack and Coke, the Lynchburg Lemonade is one of the best ways to enjoy it. You could even buy Dad his own barrel of JD. Now that would be a treat!